As one of the premier luxury droptops from Mercedes-Benz, the SL-Class has never been an inexpensive proposition. 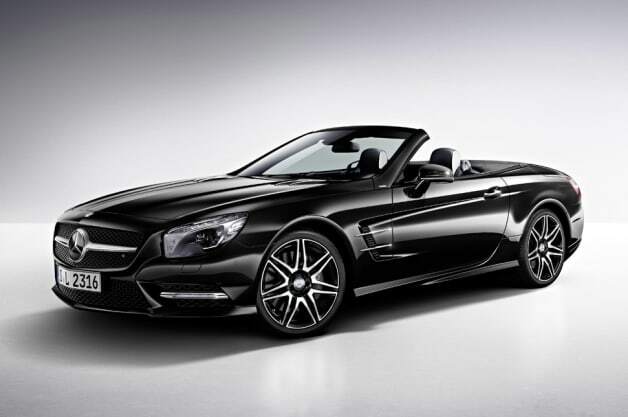 But the German brand is making it a little bit more accessible for the 2015 model year with its new SL400. The new entry-level model has quietly shown up on Mercedes’ consumer site, and pricing starts at $84,000, plus the usual $925 destination charge. While that’s still a lot of money, it’s a massive discount, ringing up at a whopping $22,900 less than the $107,825 SL550. Think of that savings as over $11,000 per cylinder, as the SL400 foregoes V8 power in favor of a 3.0-liter, twin-turbo V6 with 329 horsepower and 354 pound-feet of torque and seven-speed automatic rated at 20 miles per gallon city and 27 mpg highway. Those numbers are roughly 100 hp and 160 lb-ft less than the SL550. Still, the new model can get to 60 miles per hour in a quick 5.1 seconds, compared to 4.5 for the its big brother. Thankfully, buyers don’t have to give up the optional luxuries that makes the SL special to get the cheaper model. The Air Scarf comes as part of the $4,900 Premium Package, Distronic adaptive cruise control is available as part of the $2,950 Driver Assistance Package and Benz’s clever dimming Magic Sky Control roof is a separate option for $2,500. If the idea of a Mercedes-branded folding hardtop convertible that gives up a little power for a lot less money sounds good to you, then you’re thinking like we are. New entry-level Mercedes SL400 drops price of range by over $20k originally appeared on Autoblog on Wed, 27 Aug 2014 16:31:00 EST. Please see our terms for use of feeds.